Last night my boyfriend & I made one of our frequent stops into Ethos to satiate our vegetarian craving for really well cooked Chick-un and collard greens. If you haven’t already been, you should make a trip to the corner of Fairbanks and New York Ave. in Winter Park for this Vegan Kitchen very very soon. The first time that we had gone we had not even switched over to our vegetarian and pescetarian diets, and the absence of meat/animal by-products was not at all missed. The interior of the place is has a very modern yet comfy look, with a few hints of old train station decor and covered in huge framed art…it kind of reminds me of a Brooklyn converted warehouse apartment. Lovely! 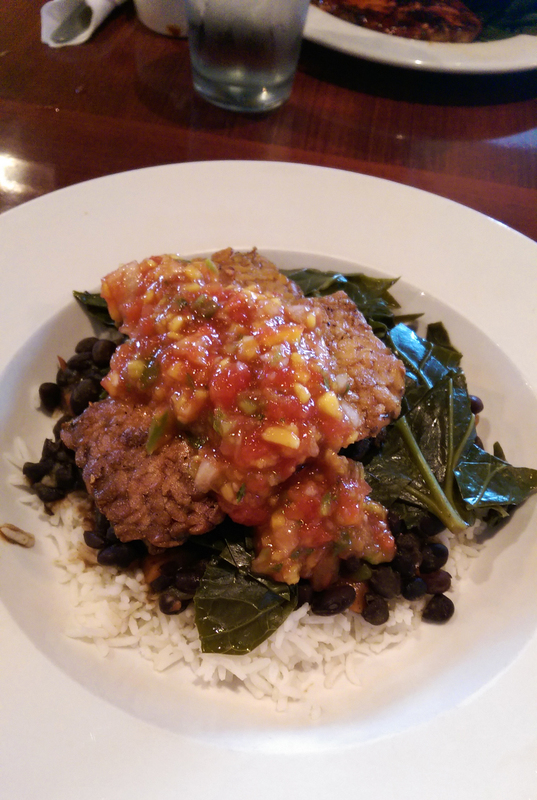 I ordered the “Blackened Tempeh” which came with mango salsa, a bed of collard greens, black beans, all on top of batsmati rice. It tastes like a well crafted, light and savory Chipotle rice bowl. (see image below) My boyfriend got the BBQ Chick-un which tastes like (and is even more tender than) a thin cut chicken breast, all done sans-animal. The BBQ Chick-un entree came with collard greens as well, and mashed potatoes with a vegan gravy that is buttery & delicious. 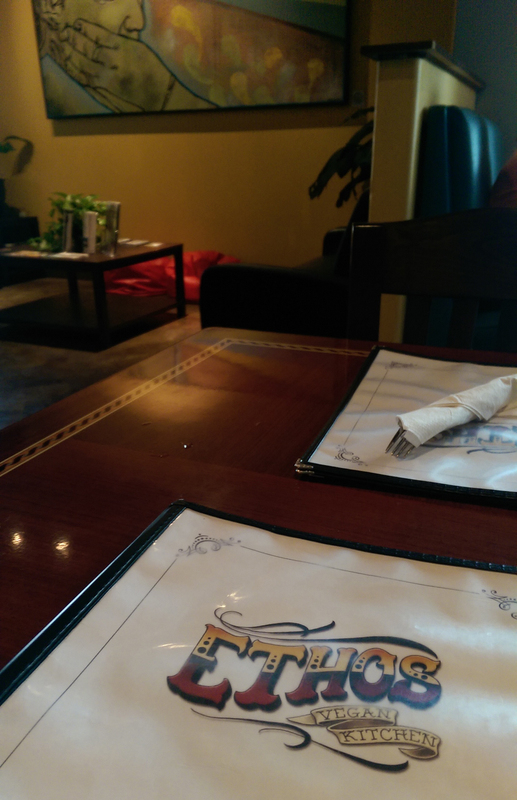 Vegan, vegetarian, pescetarian, carnivore…no matter what you identify as, if you love FOOD then you should definitely have a meal at Ethos. For about 11 dollars per person, you’ll get your money’s worth in taste, service, (ethics) and atmosphere! 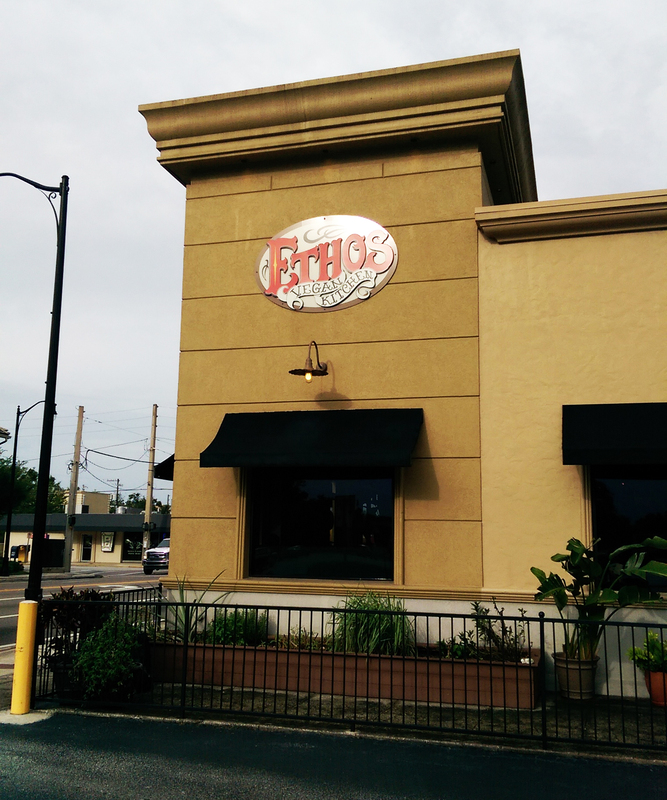 This entry was posted in Uncategorized and tagged Ethos, Foodie Files, Orlando, Park Ave, restaurant, Vegan, Vegetarian, Winter Park. Bookmark the permalink.